Pantaloon is hiving off its value retailing stores to a subsidiary, selling a few support businesses to the promoter group and restructuring its financial services business. These moves will generate cash to invest in its core retail business, reduce non-core funding commitments and ensure that debt declines. But Pantaloon’s appetite for expansion has not waned; in fiscal 2009, retail area for the group expanded by 22.5% to 11.7 million sq. ft and will grow by 26% and 20%, respectively, in 2010 and 2011. It is not only financial but also operational restructuring that should be of interest to shareholders. Though cash flow from operations is negative, the stand-alone business earned net cash from operations of Rs239 crore against an outflow in the previous year. Better inventory management was the main reason. 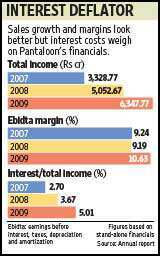 If it can sustain this improvement, Pantaloon’s business will throw up cash to fund its expansion. But the amount required will be large in relation to current cash flows. For example, its expansion plans in fiscal 2009 saw the size of its stand-alone balance sheet rise by Rs1,133 crore. That’s where the stake sales will come in handy, allowing it to expand in fiscal 2009 without unduly straining its balance sheet or financials.